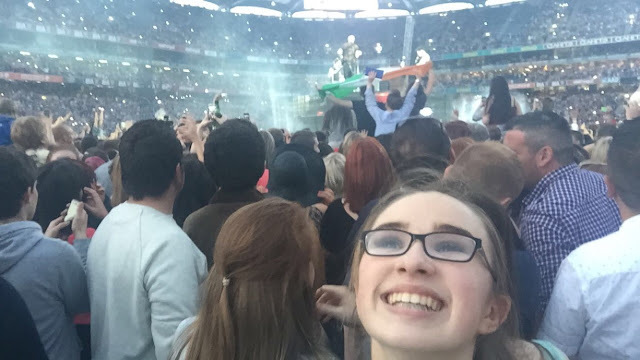 In hail, rain or sunshine I would have gone to The Script's concert in Croke Park. On the evening of June 20th, Ireland did decide to have some sunshine, and those conditions were what I favoured more! Hi! 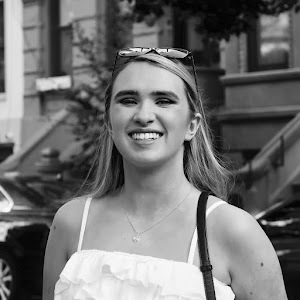 I'm back to blogging as I have finished my Junior Cert... finally!! Hopefully I'll even be back to better, and more frequent, blogging for this summer and Transition Year, and the future I guess! 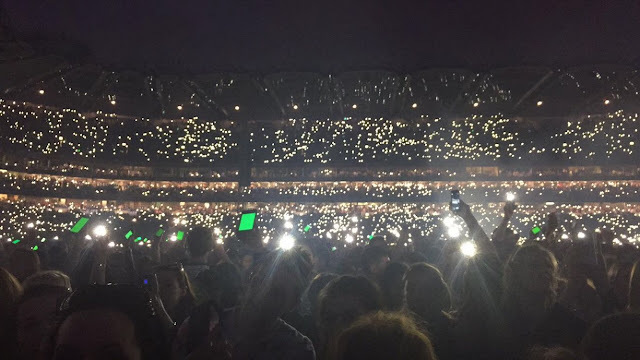 In celebration of the ending of the exams, I went out last Thursday night with friends, but also on Saturday ventured to Croke Park to see The Script perform. The Script have been a firm favourite of mine for quite a while now, my first song to love being "The Man Who Can't be Moved". They're still just a small Irish band to me, but they sold out Croke Park and live streamed their performance, and that amazed me. They put on a fantastic show! For my outfit of the night, I opted for a summery look with a bright crop top and shirt put together with high waisted jeans. The concert look was complete with my sports luxe converse. My makeup contrasted the clothes, as I created a bronze smokey eye with a pop of green - in honour of The Script's Irish nature of course. Despite the clashing colours, I believed my makeup and outfit did my concert spirit justice. If you'd like to see how and what I used for my makeup, then make sure to subscribe to my new YouTube channel as I will be uploading my first video soon! I'm heading out to America tomorrow with my family for two weeks; we'll be visiting Chicago and Niagra Falls, as well as Ontario and Toronto in Canada; I'm all packed and ready to go and have another adventure! I'll hopefully get to blog, and I will for sure take lots of photos of places and outfits. What I'm most thrilled for is shopping, shopping, and even more shopping!